Choosing the right travel stroller can be overwhelming. There are a lot of options out there and you will need to decide if you want to buy a stroller specifically for travelling. If you use a stroller while travelling with your baby or toddler and travel often, then a travel stroller becomes a very important part of your baby travel gear. What if you don’t want to travel with your own stroller? We recommend two options: either a very comfortable baby carrier or renting at your destination. See our Baby Equipment Rental Directory here. 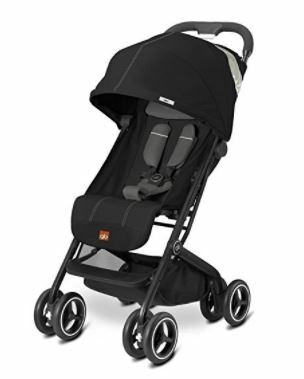 If you are looking at purchasing a lightweight stroller for travel, then this post is for you. We have spent hours researching the most popular brands that parents are using and depending on your criteria, we have filtered it down to our recommendations for a travel stroller that will best fit your needs. 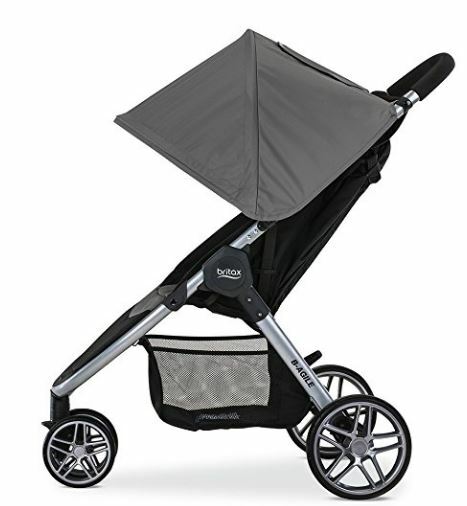 The top things to consider when looking to purchase a travel stroller are how compact/lightweight it is, does it have an excellent sunshade and can it recline so your little one can nap while you sightsee. Other important considerations are how sturdy it is on cobblestone streets, can it be easily folded with one hand and maneuverability. So let’s review! 5 Pin It For Later! 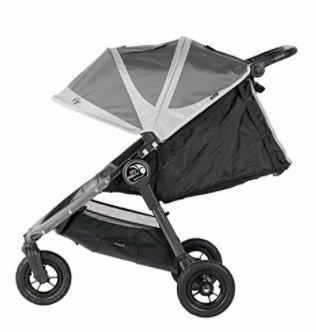 One of 3 contenders by Baby Jogger, the City Mini has a UV 50+ sun canopy with an extension and peek-a-boo window. Unlike the City Mini GT, this one does not have all-terrain wheels. At 18.4lbs, it’s definitely on the heavier side. The biggest benefits of this one are the huge canopy, the near flat recline and the one hand fold. The near flat reclines makes it possible to use with a newborn, although you may want to get a head support for extra support if using with a baby this young. 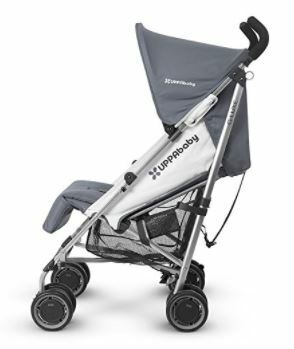 The Baby Jogger City Tour is very similar to the Baby Jogger City Mini, except it is a lot lighter and small enough that it should meet the carry-on requirements (though this may vary between airlines). One other benefit is the lower price, however its smaller size also means a lower carrying capacity so you may not get to use it for as long. Backpack style carry bag included, but you may prefer to purchase a shoulder strap for easier use when out sightseeing. The Baby Jogger City Mini GT is the heaviest of all the strollers we’ve included, but along with that comes the highest carrying capacity at 65lbs. This isn’t a stroller we would recommend as a travel stroller unless you are looking for one that can meet all of your needs at home and on the road. It has a UV 50+ Sun Canopy and all terrain wheels plus an adjustable handlebar. You can also add a glider board for an older child. 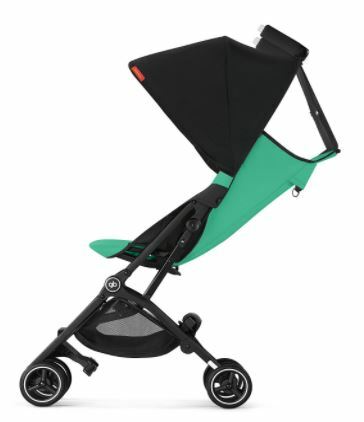 Recommended for babies from 3 months and up, the UppaBaby G-Luxe is light enough at 15 lbs and has an extendable UPF 50+ sunshade. 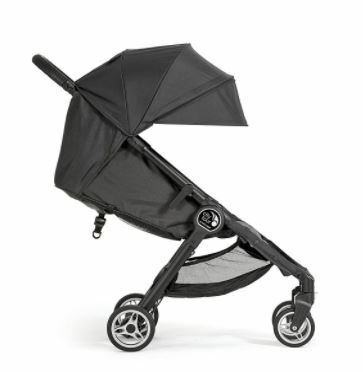 It should handle cobblestone well enough and stands up when folded, making it a great stroller for touring Europe. This one also comes with a carry strap and adjustable footrests. Keep an eye out for a new 2018 version. An additional feature of the UppaBaby strollers is their travel safe program where if you register your Travel Bag online, any damage caused to your gear during air travel is fully covered by UPPAbaby! 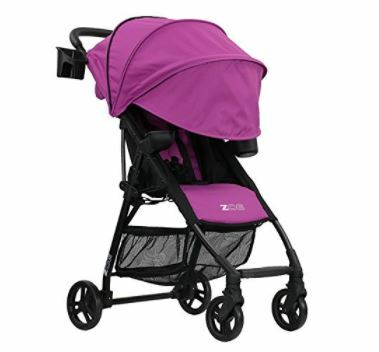 The Zoe XL1 is one of the cheapest and the second lightest of all the strollers. Given both of these, I wouldn’t expect it to be the sturdiest of the bunch, but it still has a carrying capacity on the higher end plus some other nice features. The near flat recline means it can be used from 3 months on (again, you may want to consider a head support to give your infant extra support), and it has an extendable canopy with a large hidden extension to make sure your baby is protected from the elements. Add to that its one-handed fold up system and that it will fit in most overhead bins, this is a great travel stroller. The Zoe XL1 does have optional straps or a storage bag with backpack straps. The BabyZen YoYo typically gets the most recommendations but it comes with a price tag to match. Age recommendations are 6 months +, unless using it with a carrycot then it can be used from birth on. It also has a decent extendable canopy with sun protection. It will fit in the overhead bin on flights and comes with its on transport bag plus rain cover. The Mountain Buggy Nano is probably the second most recommended one I have seen. Similar specs to the BabyZen YoYo, it’s the same weight with a slightly larger carrying capacity. 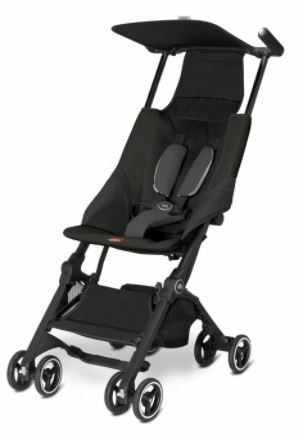 I couldn’t determine how much it reclined, however given the recommended age is 6 months + unless using a car seat or cocoon, I would assume it’s similar to the BabyZen YoYo in this aspect as well. It has an easy two-step fold and meets the airline carry-on luggage requirements. It also comes with a travel bag and shoulder strap. The sun canopy is large with a flick out solid sun visor. I’ve also seen reviews that it is easy to maneuver. The Valco Snap 4 is one of the few that claims to have a full infant recline and with a carrying capacity of 44 lbs, you should get a lot of use out of it. It doesn’t specify if it would fit the airline regulations for carry-on luggage, so I would assume that it doesn’t. If you are interested in the GB Pockit, you are really looking for the lightest travel stroller out there. At 9.5lbs, no other stroller beats it and it still has a carrying capacity of 55lbs. However, given that it doesn’t recline, you baby will need to be 6 months or older and be able to easily hold her head up. This one does not have one handed fold up and the sunshade won’t provide much if any protection. Given how ultra compact it is, it won’t be super sturdy either. The GB Pockit+ is a step up from the GB Pockit, given its added recline, better sunshade and increased lower storage. For this it comes at a slightly heavier size, lower carrying capacity and higher price. The recline is not flat, so again the recommended age it 6 months or older. Your baby should have the ability to hold his head up easily. The GB Qbit is again adding features at the expense of weight and price. At a slightly higher weight of 14lbs and price of $300, you will get near flat recline at 165 degrees and one handed fold up. It’s still a very lightweight, compact stroller with added features, like an adjustable footrest. It won’t fit in the overhead big on an airplane though. The Guzzie + Guss Pender is a true umbrella style that folds up like that. It still has a very high carrying capacity and a mid-range weight. It also has a great extendable sun coverage canopy and can be used from 3 months on. One different feature on this one is the footrest enclosure that creates a cocoon for an infant. It also has a shoulder carry strap and carry handle. Guzzie+Guss also has a new travel stroller coming to the market called the Oxygen, which we’ll include once we have more details. The Britax B-Agile has a 3-wheel configuration and swivel front wheels, that will make steering and maneuverability a lot easier, which is good because it’s heavier than most. The recline allows it to be used from newborn onwards, it can be folded one handed and has a large canopy. Don’t expect to carry it on to the airplane though. 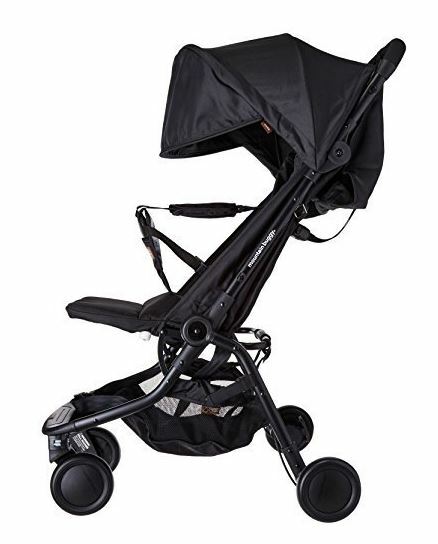 Though it has a higher price for an umbrella stroller and like won’t fit as a carry-on, its got some great features, especially the longevity. 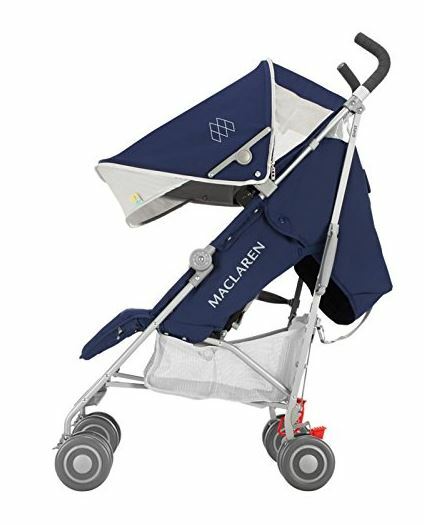 Maclaren has long been known as the stroller to get to travel with little ones, but it certainly has some competition. 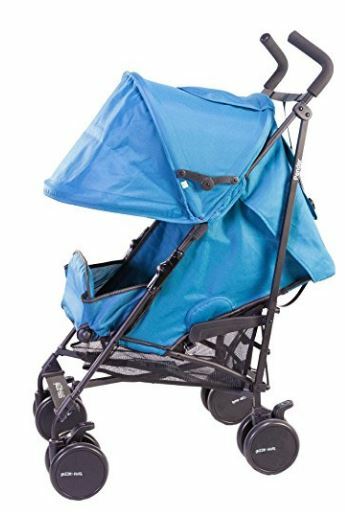 Our overall recommendation is the Mountain Buggy Nano, it’s similar to the BabyZen YoYo in almost every way but with a higher carrying capacity and a lower price. 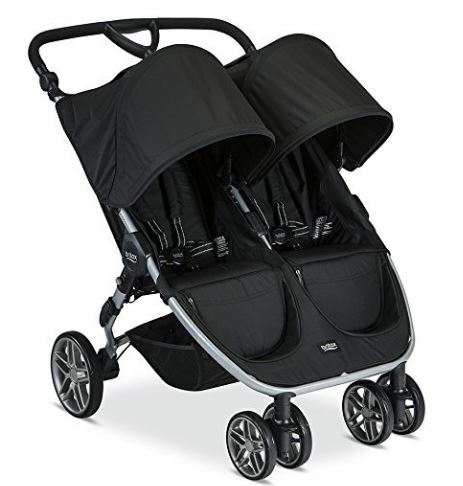 These are the two strollers (aside from the GB Pockit) that definitively say they meet carry-on regulations, they recline and they have a large canopy making them the best travel strollers. One downside of the Mountain Buggy Nano is they don’t specify the sun protection on the canopy but this could just be lack of information. 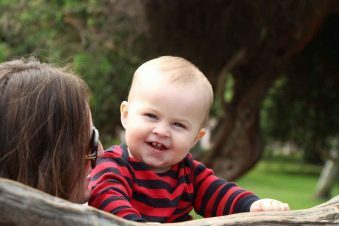 If you end up having a second baby, and your older child is old enough, you can get a ride on board rather than looking for a double stroller. Overall best value travel stroller would be the Zoe XL1. It has one of the lowest prices, one of the highest carrying capacities and a recline that is near flat. You’ll get the longest use out of this one and it’s also one of the lightest. The only reason it’s not our overall recommendation is at only $199 USD, I’m not sure how sturdy it would be compared to some of the other more expensive brands like the BabyZen YoYo or Mountain Buggy Nano, plus as far as meeting carry-on regulations it is stated as “most”. 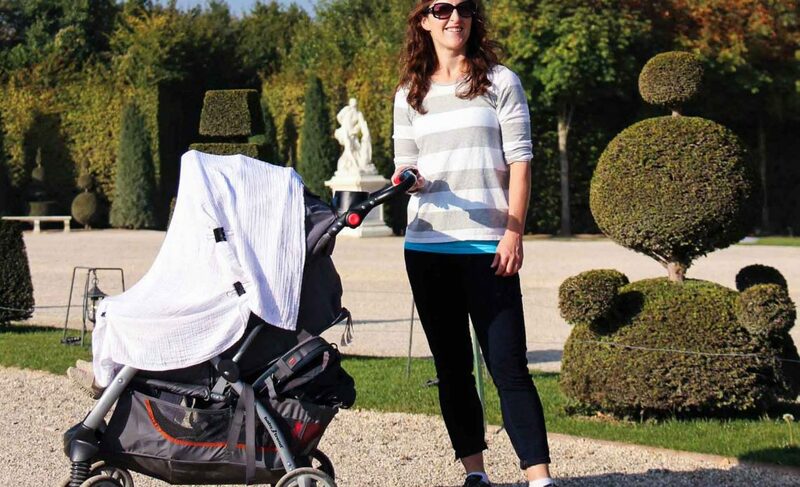 The GB Pockit is the clear winner if you are looking for the most compact stroller. No other stroller comes close, but it won’t provide the same sun protection or ability to recline for naps. 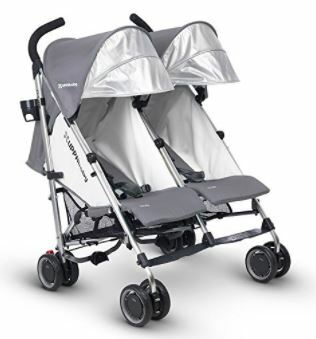 There are certainly less options when it comes to looking for a double travel stroller. If you have twins, you may want to consider one of these below, however if you have an older child and a newborn consider how much your older child will actually be riding in the stroller. You might be able to get by with one of the above strollers, a ride-on board and a baby carrier. extra kick space for people over 6' tall! into a little "cocoon" for your infant. 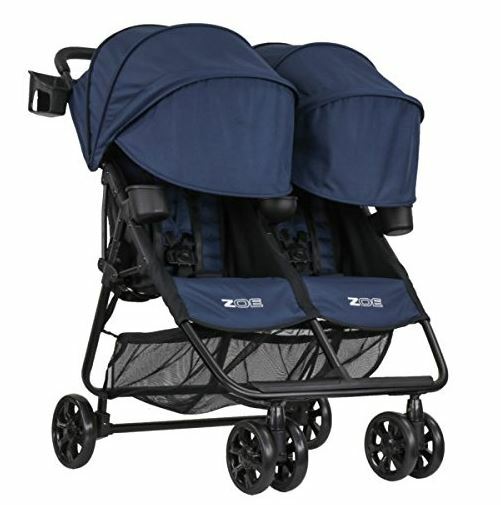 The lightest of all the double strollers and with a large 4 panel canopy plus an almost full recline, the Zoe XL2 stroller really has a lot of value. It also has a one hand fold, a recessed rear axle for extra kick space for tall people and cup holders for everyone! Its recommended use is for babies 3 months or older. It also has an optional travel backpack or shoulder strap. 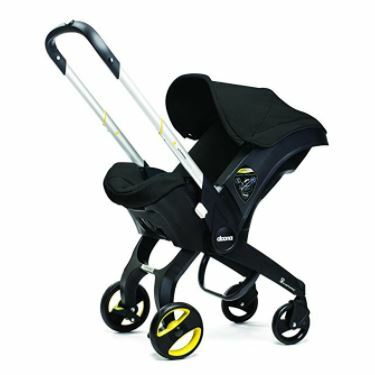 The Mountain Buggy Double Nano is a fairly new product. It is also pretty lightweight but the carrying capacity per seat is only 33 lbs, so if your child is on the bigger size you may not get that much use out of it for the price. 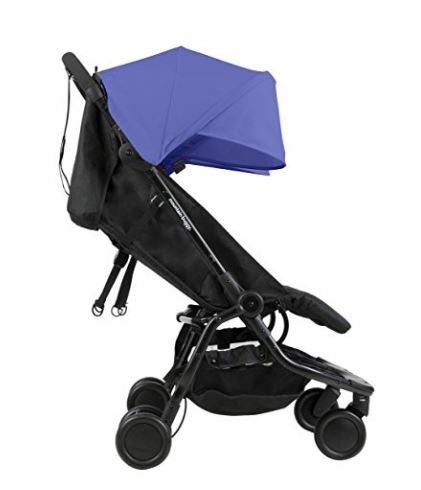 It has a 2 step compact fold and a 3 panel canopy for weather protection. Additional features include a carry handle and should strap. 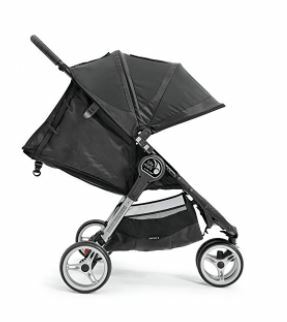 To use this double travel stroller for a baby under 6 months old, you’ll need the cocoon accessory. 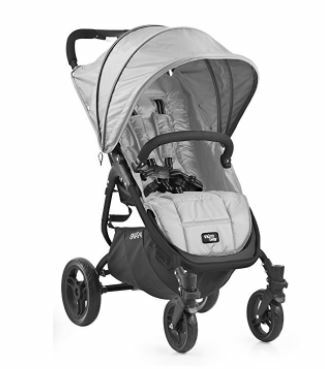 The Britax B-Agile is on the heavier side, but also has a carrying capacity on the higher side. The price tag is also on the high side unless you can get it on sale. It has an adjustable handlebar which you don’t see often on travel strollers. 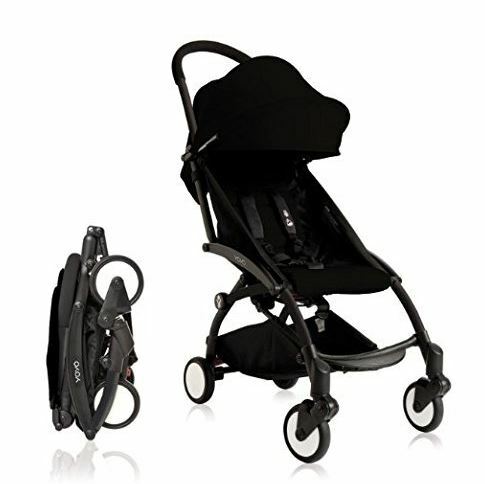 It is suitable for a newborn but in the stroller as it does not support a car seat. 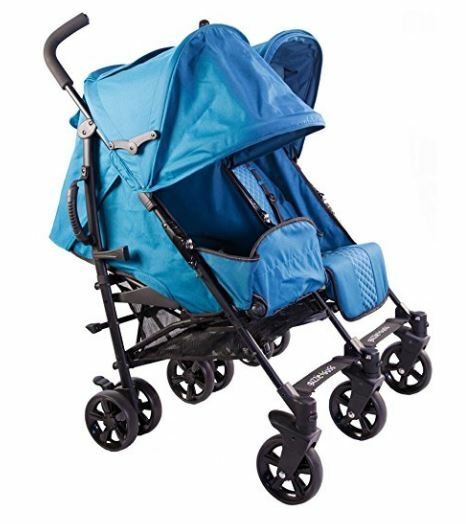 It also fits thru standard size doorways, which is a must for a double stroller! The UppaBaby G-Link has seats that fully recline plus an included headrest that allow it to be used from newborn onwards. It also has a slightly lower weight and higher carrying capacity than some of the others. The snap-on mesh foot barrier creates a cocoon for little ones and it has a one step fold. The Guzzie + Guss Twice stroller can be used from 3 months and has a great feature where the seat can be turned into a little “cocoon” to give your baby even more comfort. It has an extendable canopy and folds up umbrella style. On the higher end of the weight range though it does come at a slighter lower price than most. Again the Zoe XL2 v2 is going to give you the best overall value. It’s the lightest stroller and the carrying capacity for each seat is 55 lbs, making it a good stroller if you have twins or even a baby and an older child.